THEY BEAR THE NAME MAN outside and in– the 122 new, low-floor double deckers in Singapore. The buses are the result of coop-eration with the Malaysian superstructure manufacturer Gemilang Coachworks and the support of MAN Truck & Bus Asia Pacific, as well as the local importer STK. 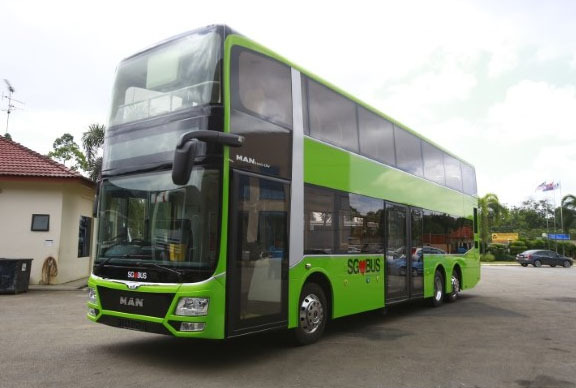 The buses feature an MAN chassis and an aluminium superstructure contributed by Gemilang. Due to the utilisation of composites, the The lion roars in Singaporebody is one of the lightest on the market. When it came to designing the look of these eye-catching double-decker city buses, the expert companies from Singapore and Munich also collaborated closely. The three-axle, low-floor chassis features a sound-dampening, low-emission Euro 5 engine and a 6-gear Ecolife transmission made by ZF, Germany. The chassis units will be delivered before the end of this year.